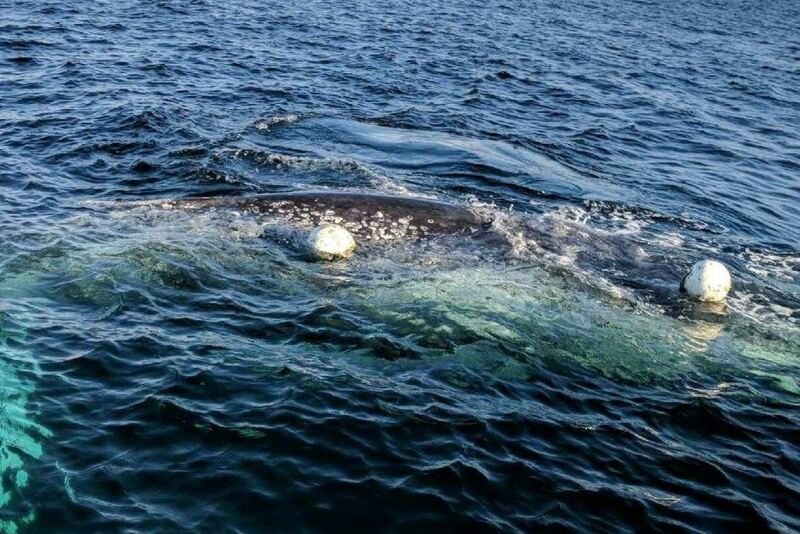 This whale was freed of rope and floats off the mid-north coast in July. Photo: NPWS. Whale watchers and boaties at sea have been keeping watch for a whale feared to be entangled in marine debris. The possible entanglement was reported off the Narooma coastline near Montague Island on Saturday. The National Parks and Wildlife Service launched a plane from Merimbula Airport on Sunday in an attempt to locate the whale. A spokesperson says at this stage the whale has not been sighted by Parks staff. Local boat operators headed out to sea from Narooma and Merimbula have been informed by Marine Rescue NSW and asked to report any sightings. As whale numbers continue to recover and rebuild; the tails and fins of these massive mammals are increasingly getting weighted down and tangled in fishing nets, rope, and various other marine debris. A humpback whale caught in 100 metres of rope off Sydney was rescued in July by a specialists disentanglement crew from the NPWS. Once an entangled whale is located buoys are attached to slow the animal down allowing rescuers to get closer to the whale and cut obstacles free; a difficult and dangerous job. Eight weeks ago, the NPWS told the ABC that there had been eight whale entanglements so far in 2018, compared to 21 from last year’s migration season. The NSW Government’s, Wild About Whales website suggests that in the US 10-20% of humpback whales suffer entanglement injuries each year. AWESOME! Loving the inquisitive juvenile humpbacks coming past Merimbula at the moment. This young whale stole our hearts this afternoon when it surfaced right next to True Blue! The coastline of the Eurobodalla and Bega Valley is being treated at the moment with regular sightings as whales of all species and ages head south for the Antarctic summer. To report whale entanglements or strandings call the NPWS Incident line on 1800 232 170 quoting your location and as much information as you can.